The Power Monitor for the MPLAB® REAL ICE™ In-Circuit Emulator (AC244008) consists of the power module and an external power supply that allows the MPLAB REAL ICE in-circuit emulator to monitor current and voltage of the target board or device. Note: Refer to the Release Notes for the MPLAB REAL ICE In-Circuit Emulator in MPLAB X IDE for a list of known issues. To use the Power Monitor, you must connect the appropriate hardware, install the plugin, and set up MPLAB X IDE. These topics are covered in subsequent topics. Power Data with Program Counter (PC) MPLAB X IDE v1.90 (Firmware) Refer to the Release Notes for the MPLAB REAL ICE In-Circuit Emulator for current support. * See Power Monitor Usage for feature details. Only basic debugging features are available when using the Power Monitor, e.g., Run, Halt, and Single Step. No advanced features, such as Data Capture, Runtime Watches, Application In/Out or Instrumented Trace, are available. 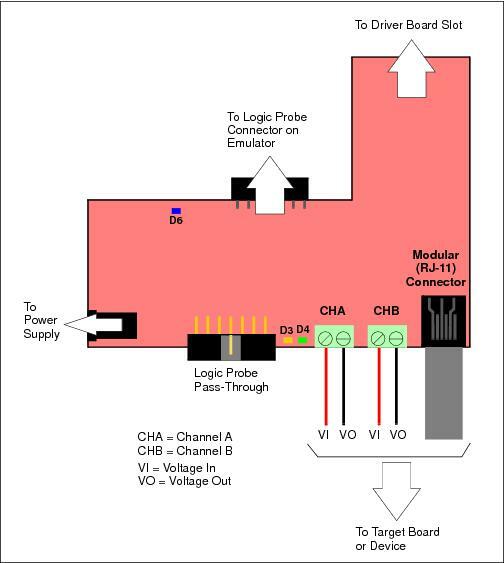 The Power Monitor board is laid out as shown below. For more details, see Hardware Specifications.